In the new film Heights, Glenn Close plays a famous New York stage-and-screen actress, but the real protagonists are the twentysomethings in her shadow. They aspire to have the success that she has, but for now, all they can do is keep working and hope for that big break. The making of Heights tells a surprisingly similar story. It’s the first feature for director Chris Terrio and screenwriter Amy Fox. Both are aspiring twentysomethings working in New York. The long shadow under which they worked wasn’t cast by a great actress but by a great film producer, Ismail Merchant, who passed away this spring. Heights follows a handful of young characters. One is an actor (Jesse Bradford) with his own roles and auditions to worry about. His day is disrupted when Glenn Close’s character invites him to watch her afternoon audition and to attend her evening party. What’s a young man to do when work and aspirations collide? Another character is the great actress’ daughter (Elizabeth Banks), who wants to be a great photographer. Her fiancé was once the homosexual lover of one of the world’s great photographers, a fact her fiancé carefully keeps secret from her. And while she is turning down a dream job at a major magazine because of their wedding plans, he scrambles to keep his past from reaching her eyes. Heights screenwriter Amy Fox has been working with this material for five years. She has been trying to make it in New York for even longer. “When I was right out of college I worked in publishing for two years. It wasn’t giving me enough time to write. With the publishing salary, you can actually make the same money doing some part-time jobs, so I started doing that instead. Terrio had decided to attend USC to get a degree in film production, so dinner in New York with James Ivory was a minor detour between Cambridge and Los Angeles. But it wasn’t the end of their partnership. Terrio continued to work in the Merchant Ivory offices. He shot the behind-the-scenes documentary for Le Divorce. He also worked with Matthew Modine on a reading of a lost play for their foundation for the arts. 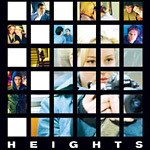 Heights opened in New York and L.A. in June 2005. It’s starting to show up in art-house theaters across the country, to mostly positive reviews. It wouldn’t be a stretch to call Heights a success. But even though he has the first notch carved on his belt, Terrio still relates to the people in the film. Many of us would say he has graduated from “aspiring” to “made it,” but Terrio is carful not to count his chickens. Fox, too, is keeping her success in perspective. There is another perspective on Heights, but it’s statistically less likely to be held. It’s the view from the top, as held by Glenn Close’s character. You can see her wearing her fame to cover her insecurities, or brandishing it to get what she wants. But underneath, she’s just a person. She was once like these young people, and someday she will be gone and all this will be theirs. Better to pass the torch gracefully and encourage the talent she can see in them. It’s hard not to imagine a little Ismail Merchant in her character.